I’ve been big into firearms for quite some time now, but decided to really up my game in 2018. So I decided to log my training hours for this year as an accountability tool to keep me going throughout the year and to provide an interesting bit of review at the end of the year. So here’s a write up of a bunch of different lessons I learned for the first time, or had seriously confirmed due to my hours of training this year. 212 hours and 31 minutes of total training, which averaged out to an average of 35 minutes a day. While I don’t have as many quantifiable numbers for skill progression as I would like, I most definitely have had major improvements in skill this year. These improvements can be seen when reviewing my shooting videos comparing the beginning to the end of the year as well as looking at my match placement improvements. I also started the year as a high C class USPSA shooter and I’m currently flirting with Master Class classifiers. I was one A zone hit away from an M Class classifier. This pretty clearly shows how much you can improve just through dry fire, but I definitely could have improved even more with more live fire. Although I did get in more than 27 hours of live fire due to the many classes I took. More live fire is one of my goals for 2019. All of my biggest breakthroughs last year came through some form of outside influence, most of them through some instruction. Take classes everyone! Diversify the instructors you learn from and a good instructor will give you some nuggets of information, even if you thought you already knew it. Trying out a new competition format or getting your hands on a different gun can be very informative. I noticed some gaps in my skills by attending some falling steel matches and it probably would have been a while before I noticed them if I only attended USPSA matches and run and gun matches. Even trying out a new gun can be educational as getting some training time in behind a CZ P10 has provided some insight into grip possibilities and an inconsistency in my reload. Variety is the spice of life and variety is a great way to learn something new, even if that learning experience is identifying a technique flaw to work on. All but one of my lightbulb moment breakthroughs have been thanks to outside instruction. By “lightbulb moment” breakthroughs, I mean hearing a bit of information, trying it, and noticing a near instantaneous improvement in my technique. If I have to choose between paying for a class or countless hours of repetitive training to overcome a particular hurdle, I’ll choose a class without any hesitation. I totally get it, over 200 hours of training in a year is way beyond what most people would want to put into a hobby, doesn’t matter if the interests are competitive shooting, casual plinking, or conceal carry. But just a little bit of dry fire every week can make for huge improvements in your skill, and if your interest in firearms includes conceal carry – that skill could mean the difference between life and death. Notice how I emphasized “dedicated” training – it’s a very important clarification. Going to a shooting range with shooting bays and casually putting a few boxes of ammo into a target in front of you is NOT dedicated training. Dedicated training involves getting into a learning mindset, analyzing your technique, and seeking out ways to improve your performance. This can be done at the range through live fire or at home through dry fire. I strongly recommend finding at least 15 minutes a week for dedicated dry fire practice and a trip to the range at a minimum, once every other month. It’s fun to get some time behind a gun, and it’s even more fun to notice an improvement in your performance. Which is a nice segway into dry fire practice. I’ve had someone tell me dry fire is pointless and I need to “man up” and get the budget for live fire training or to not train at all. However, I do live fire practice, and I’d love to become friends with the person who has the budget for over 121 hours of live fire training in a year – and I know I’m going to have even more than 121 hours of dry fire training this year. 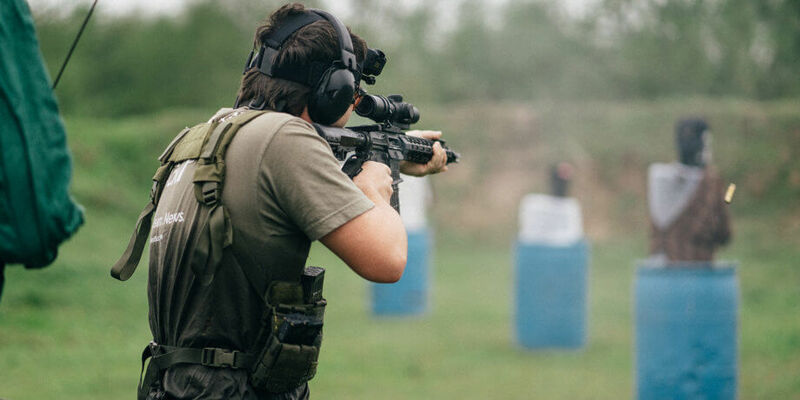 Dry fire is the most cost effective way to train and you can identify shooting technique issues thorugh dry fire that would be extremely difficult to identify through live fire. You can practice everything thorugh dry fire that you can in live fire except recoil control. 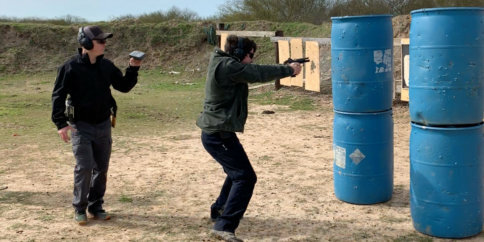 The key with dry fire is to be honest with yourself, self analyze your technique, and validate your dry fire training through live fire practice. Improper dry fire practice can create bad habits and hurt your growth, so don’t lie to yourself about a 0.6 draw time when you obviously weren’t even close to hitting the target. Seriously – dry fire more. You’ll improve. Here’s some tips on dry fire training. One of the easiest bad habits to create through dry fire is a weak grip on the pistol. A firm grip on the pistol is critical for accuracy and controlling recoil for fast follow up shots. Gripping the pistol tightly should be instinctual and a weak grip in dry fire will completely mess that up. Your forearms should be tired at the end of a good dry fire training session. I’ve found this in my own personal shooting and through other people I’m coaching. If you have strong fundamentals and good accuracy, you can almost certainly increase your cadence more than you think and still retain practical accuracy. Which leads into the next point. In order to become faster, you can’t just shoot at your current cadence and hope that someday you’ll be faster. You have to push your limits and shoot faster while letting your accuracy suffer – as long as you don’t lose control of the gun and shoot in an unsafe manner. If you’re getting tight groups, try increasing your cadence until you’re getting shots into the D Zone of an IPSC target. Then slow your cadence back down a little bit until you’re getting mostly A Zone hits and some C Zone hits. You’ll probably be surprised at how much you can speed up your shooting cadence and still get all shots on a human size target. It may seem self absorbed to film yourself at the range or to ask a friend to film you at a match, but it’s an amazing learning tool. I don’t know how many issues with my technique or other areas I could improve I’ve found by filming myself through first and third person. I like filming both. There’s some technique issues you can spot in third person but can’t spot in first person, and vice versa. It’s also very encouraging to watch your old footage and see how much you have improved over the year. 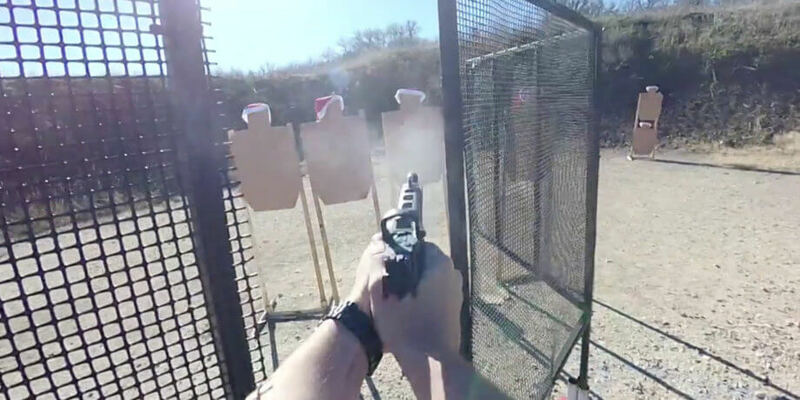 I got an opportunity to run a red dot mounted pistol through a USPSA stage and was hooked instantly. All it took was that one stage. Not only do I shoot better, but it’s something I simply enjoy more. I want to get in even more training this year. I had some big gaps during the summer due to planning a wedding, as well as a stint of laziness in late spring. I’ve gotten a lot better with self discipline and I don’t have a wedding to plan, so I’ll be able to stick to my training plan easier. I want to get in more classroom hours this year, but since I went to a 5 day class last year and I have a pretty full match schedule this year, I don’t know if I’ll be able to meet that goal. Finally, I will be getting in more live fire training this year though. I’ve also recently acquired a CZ P10 that I’m going to be running through its paces to just give it a try in the production class for a little bit, and if I like it, I’ll end up switching it to my CCW gun and running it with a red dot in competition.